National Toxicology Program (NTP) Pathologist David Malarkey, D.V.M., Ph.D., was elected this summer as 2015 president-elect of the American College of Veterinary Pathologists (ACVP), an organization of board-certified specialists that has been setting the standard for veterinary pathology since 1949. The announcement from ACVP secretary-treasurer Michael Topper, D.V.M., Ph.D., appeared in the September issue of the organization’s quarterly newsletter. Malarkey, who has been a diplomate of the ACVP since 1993, is the leader of the NTP Pathology Group, which provides peer-reviewed pathology evaluations that are considered the gold-standard by regulatory agencies worldwide. His group members provide data and scientific interpretation for all toxicology and carcinogenesis studies at NTP for eventual public dissemination. The group offers specialty training positions for veterinary pathology trainees and other scientists, as well as externships for veterinary or other students. “ACVP is the largest organization of all board-certified veterinary pathologists in the world. [David’s] election is a tremendous honor for NTP and NIEHS and underscores the amazing pathology leadership we are privileged to have,” said Robert Sills, D.V.M, Ph.D., head of the NTP Cellular and Molecular Pathology Branch. 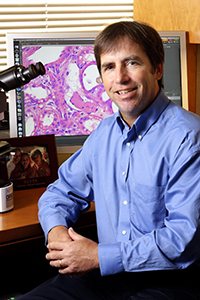 Malarkey, who is currently finishing his fourth year on the ACVP Council, will start his new position at the end of the ACVP annual meeting Nov. 8-12 in Atlanta, in partnership with the American Society for Investigative Pathology. He was chosen in an election with the largest turnout of voting members in the history of the organization. As president, Malarkey will lead an elite cadre of 2,100 members, who are all board-certified pathologists. Veterinarians who successfully complete the certifying examination are accepted into the organization as diplomates. “I am honored and thrilled to lead and represent the membership,” said Malarkey.